It wasn’t that long ago that we told you about the unfortunate closure of Bizarre Creations but we also knew it wouldn’t take long before some of these talented folks would start to resurface…and now they have! Hogrocket was founded in March 2011 by three former senior members of award-winning developer Bizarre Creations and will concentrate on providing extremely high-quality games on mobile, social and connected platforms. Rage, the not yet released Bethesda/id Software FPS, is also being developed as a novel and will be released before the game. 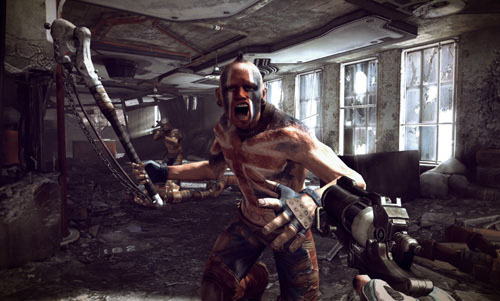 Written by author Matt Costello, the novel (also titled Rage) delves even deeper into the world and its characters and will hit store shelves on August 30th 2011; two weeks before the game’s release on September 13th. Costello also served as the game’s writer. Rage is set in the not-too-distant future after an asteroid impacts Earth, you emerge into a vast wasteland to discover humanity working to rebuild itself against such forces as bandit gangs, mutants, and more. Quality Time With Twisted Pixel! Crowds of people lining the booth and aisles subject to overflow, all eyes were glued to the big screen for The Gunstringer and Ms Splosion Man were in the spotlight at Twisted Pixel’s booth at Pax East. Fresh off the heels of GDC in San Francisco, Twisted Pixel was going strong and bringing all sorts of fun to the east coast! I stopped by for a while and got the chance to play Ms Splosion Man, watch their timed tourney (in which they gave away an exclusive Ms. Splosion Man console) and ask Twisted Pixel’s Jay Stuckwisch a few questions about the upcoming titles. Exclusive console giveaway at the Twisted Pixel booth. You guys were just at GDC with these games? Jay: Yeah, we were! Mike and Josh went out. Mainly they were just showing off Ms Splosion Man but they did have Gun there as well. We showed Gun off at the showcase event the weekend before. Well there is a HUGE reception here at your booth and packed every time I come by. Are you finding that the people here at PAX have been exceptionally receptive or is just everyone loving what you guys are doing? Jay: It seems like everyone has been really super excited! The showcase event really helped a lot with Gun. I think a lot of people maybe kind of didn’t ‘get it’ you know. And then once people actually saw the game play and how people were responding to it, it really, the fans have just been awesome. And we are really proud of that. For both games! Okay, I have to ask. So, Ms Splosion Man – is she the next leading female heroine? Jay: You know what? I would LOVE to think so because she’s pretty awesome to me. Head on over to GirlGamer.com to read my full interview with Jay of Twisted Pixel Games. CES ’11 – Alienware M17x gets a 3D upgrade! Dell recently unveiled the newest version of the M17x laptop at this year’s CES! Alienware, a name synonymous with pc gaming, has announced the M17x R3. A new version of the model that retains the sexiness that the Dell subcompany is known for with all the awesomeness you need to hack slash and slay but now in 3D. :O Want to know what it will bring you? iPhone App Preview: Bouncer Boot Out! When you’re at the club having a great time with friends when some lame-o starts killing the vibe, ever find yourself thinking ‘How did this guy get past the bouncer?’ or perhaps that even YOU could do a better job? Australia based 5th World is letting you live out your Road House fantasies with their new iPhone game, Bouncer Boot Out! Using swipe controls players are able to: flick undesirables out of the club line, manage the queue by swapping characters’ positions and create combo boot-outs. Players must also keep an eye out for the instant-death character: a school girl intent on sneaking past the line and into the club! What was the best gift you received this holiday? Was it game related? Thanks to charitable gamers and fund raising efforts around the world, children in over 60 hospitals worldwide this holiday will get some epic win gear!! A two million dollar congratulations goes out from everyone at Girl Gamer to Child’s Play for their amazing record breaking year in 2010 by raising $2,294,317 and organizers could not be happier. Humble Indie Bundle donating $300,000, LoadingReadyRun’s Desert Bus for Hope marathon raising $207,000 and Gears of War’s “The Fate of Carmine” t-shirt campaign bringing in $150,000 added to the list of the amazing contributions that the organization received. Operation 7 offers 5 FPS modes that will keep you engaged again and again. Head Hunting, Deathmatch, Survival, Hold Line, and Demolition. Each self-explanatory mode includes over 90 modern weapons based on real-life firearms. The truly enthralling aspect of the weapons plan in Operation 7 is the ability to create your own weapons. With 540 gun parts that you can combine and assemble, you will no longer be content to using the same weapons as your opponents. Operation 7 is a MMOFPS similar to many other titles in the genre. The game is downloaded to your PC and played through the game’s server in order to connect you with other players. The game has a tutorial and training level that is very reminiscent of another FPS that you may have played *cough*COD*cough*. The game touts somewhere in the vicinity of 22 maps in which players can engage in quick combat with up to 24 players. The community for the game is growing and I constantly found rooms that were both full, queuing, and idle. The gameplay is fast paced, which makes up for the very familiar feel in what is already an overcrowded genre. There are some unique aspects to the game such as the ability to lean, to heal, and create custom weapons. The character creation is limited and lacks the option to play as a female, but very quickly you forget about that and begin to sift through the weapons selections which coincide with your keyboard’s……….. The R2Beat controls are simple. Your customizable character is propelled forward and it is up to you to navigate through a series of obstacles and pick ups to maintain your speed. The better you do, the faster you go. The more mistakes you make, the slower and thus farther behind your character becomes. Using your direction pad and control key, you will be able to gain turbo abilities. he R2Beat controls are simple. Your customizable character is propelled forward and it is up to you to navigate through a series of obstacles and pick ups to maintain your speed. The better you do, the faster you go. The more mistakes you make, the slower and thus farther behind your character becomes. Using your direction pad and control key, you will be able to gain turbo abilities. As I began to play through the tutorials, the complexity of the control combinations increased in difficulty and much to my surprise the much coveted 100% was not easy to obtain. With roller skates on foot and a continuous rhythmic beat the player is able to jump, duck, and strafe from side to side. Special ramps require double jumps to clear and conclude with starry finesse. Much to my surprise, rail grinds, quarter pipes and spiky pits all were among the list of items I would encounter during the race. Based from the Korean novel, “Children of the Runes”, Talesweaver tells many stories through the use of various characters during gameplay. The characters, who are for the most part teenagers, reveal tales of revenge, amnesia, family lineage, adventure, and heroism. Each character’s unique story is dictated by the choices and scenarios that you encounter during the game. The Characters Boris, Lucian, Cloe, Nayatrei, Sivelin, Mila, Maximin, Ispin, Tichiel, Joshua, and Lanziee range in age from 17-24 and have their own individual strengths that they bring to the game. The characters are endearing and excellently rendered. During my time I chose to play as Boris. Boris is friend to Lucian and feels compelled to watch over him in what felt to me like an older sibling type of relationship. Lucian and Boris together seek adventure and revenge. The character’s histories involve themes such as family, nobility, and magic……….